After enjoying January's block so much, I was excited to get started on February's Lucky Star BOM. I actually thought this block was easier and faster than last month's, or maybe I am just used to the idea of making a tiny block since I made the 6.5" version again. My plan for my fabric choices each month is to use one Flea Market Fancy print and match it with some coordinating prints. Hopefully that way the blocks will be somewhat cohesive without being too matchy. I'm CRAZY about these fabric choices. Love the fabric and the pattern, especially the first one. 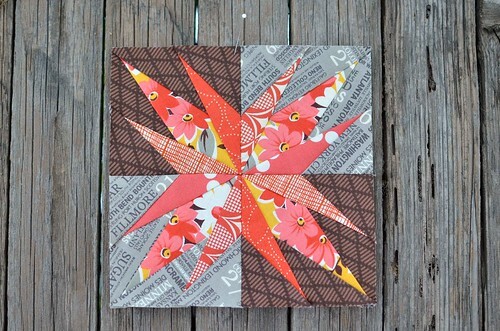 I love how you used 2 different background fabrics on the Feb block! That's the thing I find with paper piecing - too much waste. Your stars look great - I particularly like this latest one. These blocks are wonderful and inspiring. 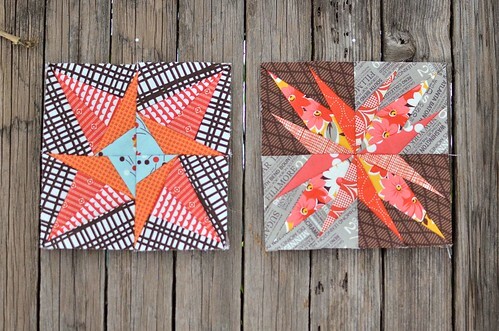 I may have to start some paper piecing again. Erica, those are absolutely GORGEOUS blocks! Love your blocks! The two fabric-backgrounds add alot of interest. And I agree the fabric was way more than you needed on some pieces, but definitely a beautiful block! p.s. I shared on my A Quilter's Table fb page! Ooh, I like the mix of prints. I've been thinking of using solids with black and white, but I can't decide which colors. great blocks - love the fabric you're using.